NYC is driving toward a market-based model for its distribution system—with energy storage integrated at the grid edge. The executives at Demand Energy believe that New York might be the mother of all energy storage markets. In 2013, Demand Energy was one of a number of startups venturing into the enterprise with a system that managed energy storage, inverters, software, big data analytics and sometimes solar. That describes behind-the-meter (BTM) storage, and today it's a small but booming market, according to a new study by the Energy Storage Association and GTM Research. 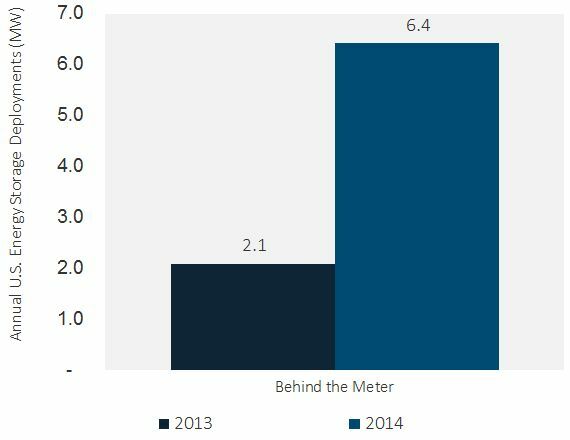 The market tripled in 2014, and while behind-the-meter deployments were 10 percent of the total 2014 energy storage market, BTM storage will soon claim a much bigger fraction of the market total, according to the analysts. In Demand Energy's earlier days, the firm had developed a project with Glenwood, the owners of Manhattan's 58-story Barclay Tower, which used a 225-kilowatt/1-megawatt-hour system in the building's basement and achieved positive results. At the time, Doug Staker, VP of global sales at Demand Energy, told GTM that the building owner was ready to install storage in three more buildings in its portfolio based on the project's outcome. But Demand Energy, despite what seemed like a firm understanding of the market and some early customer wins, went quiet. "Don't care if it's Chinatown or on Riverside"
The firm had spread itself thin and encountered some bumps in its financing, but managed to keep its core team together, and, after a year of study and work, raised a Round A of funding from undisclosed "strategic" sources. (Previous funding also came from undisclosed sources.) In any case, the company is back with funding and a tighter focus. 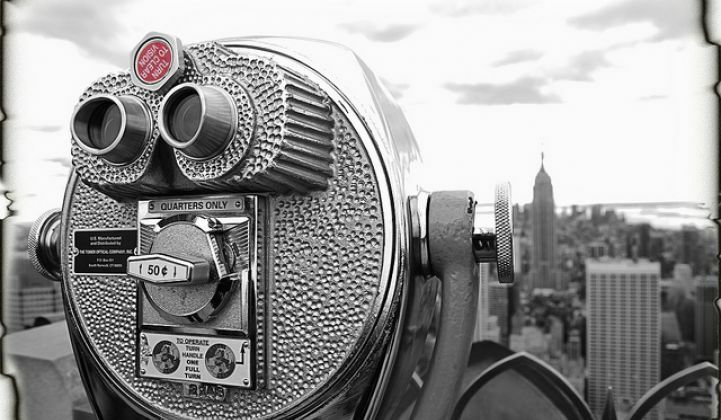 That focus is on New York and New York City. "We believe that California and New York are equally compelling markets," said Staker. He suggested that New York City is driving toward a market-based model for its distribution system -- with energy storage and other distributed energy resources at the grid edge. Gregg Patterson, the CEO of Demand Energy, noted in an interview with GTM last week, "New York is the most deregulated market in the world (with the exception of maybe New Zealand or Australia). We can take advantage of the transactive energy [market] and drive multiple value streams." Staker gave a list of reasons why the New York market is different from and at least as compelling as the market in California. At the policy/regulatory level, New York has fewer stakeholders, along with an aligned core vision around the REV initiative. Storage aims to solve the peak load reduction challenge in New York, in response to the potential closing of the Indian Point nuclear plant. High penetration of PV, along with demand charges, drives storage in California, according to Staker. The energy storage market in New York requires a larger 4-hour system operated five days per week (in peak summer months) to meet the incentive requirements. This is a different operating model than the smaller BTM systems that are prevalent in California. The REV initiative is driving toward a retail market at the distribution level. This will create a market-based (not incentive-based) opportunity for products that leverage BTM energy storage. GTM Research energy storage analyst Ravi Manghani notes, "New York is currently leading the charge on the future of distributed electricity system, where storage will undoubtedly play an important role. In addition to Con Edison's demand management programs for the Indian Point nuclear plant and the Brooklyn and Queens substation deferral, there will be a handful of energy storage projects announced in summer this year as part of the REV demonstration phase, as requested by the New York PSC. These projects are aimed at providing utilities and third parties a test bed to experiment with different business models and applications that fit within this market-based approach." Staker told GTM's Stephen Lacey in an earlier interview, "Utilities are too slow. Commercial property managers and companies want storage on site." When the power fails, there are issues with elevator systems, voltage response problems when the grid sags, or having elevators trip. He called it "a real operational issue." Staker noted that Superstorm Sandy changed people's perceptions about grid reliability and disaster readiness. He says some New York City building owners are willing to pay to be able to provide crucial backup in the event of a power failure. The system also allows for demand charge management and the ability to offset generation across periods of peak demand, or minimize the impact of EV charging infrastructure. Staker spoke of the system integrating with utility demand response programs and engaging in permanent load shifting. Demand Energy deploys lead acid batteries from EnerSys. In previous interviews, Staker has said that lithium-ion batteries require more management, whereas fire codes, building codes, and recyclers are comfortable with lead-acid technology. "I'm living where the nights is jet black"
The newly revived Demand Energy is still engaged with Glenwood, the owner and builder of luxury apartment buildings throughout Manhattan. In fact, Demand Energy and EnerSys have a purchase order from the builder -- and Glenwood is deploying the first megawatt of distributed energy storage systems across a group of buildings in its New York City real estate portfolio. Construction starts "this month on systems in the first properties, with commissioning and measurement/verification approvals [slated to be] completed in the first half of the year. The energy storage systems will be operational for the summer peak load season and will support the Indian Point demand management program," according to Staker. Demand Energy claims, "The deployment of an aggregated 1 megawatt of energy storage across Glenwood’s properties represents the first example of a networked distributed energy storage portfolio in NYC that is capable of managing individual building loads in real time or responding as an aggregated asset to a critical power event called by Con Ed or NYISO." "Cruising down 8th Street, off-white Lexus / Driving so slow, but BK is from Texas"
The Indian Point plan targets 44 megawatts to come from "load management," which can include storage, as well as demand response. The total target is 125 megawatts, which includes 25 megawatts of combined heat and power, 40 megawatts of energy efficiency and 16 megawatts of fuel switching (switching to non-electric air conditioning). The NYSERDA/Consolidated Edison demand management incentive, stemming from the Indian Point Plan, is $2,100 per kilowatt for battery storage. That provides roughly 40 percent to 60 percent of the installed cost of a battery system. That's really generous, and along the lines of the incentives provided by California's SGIP program. Audrey Zibelman, the Chair of the New York State Public Service Commission, recently asked Demand Energy to highlight what was working and what was holding up applications for the Indian Point Demand Management Plan incentive. Demand Energy responded with a long letter -- and what Staker called a "punch list" take on the situation. Here are some choice excerpts. Regional generation supplied by Indian Point is at risk of shutting down, removing 2 gigawatts of base load supply that supports a 13-gigawatt regional system peak. Transmission and sub-transmission links are challenged to deliver supply during critical power days. As growth continues within the city, various distribution segments have or will become overloaded and require load reduction to remove stress during peak summer days. The Indian Point Peak Load Reduction Incentive supports the opportunity to place more customer-owned energy storage in the electrical system for reliable load relief. However, the ability to provide sufficiently attractive energy and power cost reductions for many commercial customers is challenged due to the non-coincidence of building load with system peak, although the peak may, in fact, be coincident with localized network peaks within New York City. Indian Point PLR Operational Challenge: The incentives under the Indian Point program provide financial support in offsetting the capital cost of an energy storage system. The goal of the incentive is to provide system/network relief during the summer peak load periods (2 p.m. to 6 p.m.). While the incentive helps make the business case for onsite storage more appealing, it does not provide the opportunity for the commercial customer to reduce its demand charges during the summer months when demand charges are the highest. Even under standby rates, the peak usage for a commercial operation could occur outside of the 2 p.m. – 6 p.m. operational window. According to Demand Energy, "We can solve the utility peak power problem from a system view by implementing rates that align the energy and power economics of a building’s load profile with load reduction during the system/network peak. [...] We have proven that energy storage can meet the requirement for daily demand reduction and, with the flexibility of a standby rate, can switch operational modes and provide extended load reduction during critical power events. The challenge, as we see it, is how...the PSC/Con Edison [can] provide an incentive for commercial accounts to deploy this technology to provide system load relief and simultaneously drive savings for the commercial user. [...] We believe [the solution is] a new commercial rate that is voluntary and has retail delivery charges for both energy and demand that are based upon a locational marginal based hourly price, similar to how NYISO [sets] wholesale day-ahead energy prices." "Then one fine mornin', she puts on a New York station / You know she couldn't believe what she heard at all"
Stem is winning designs with a similar hardware and cloud-based BTM optimization solution for buildings. Tesla is installing megawatts of SGIP-supported non-residential BTM energy storage, in tandem with rooftop solar from SolarCity. Stem and Advanced Microgrid Solutions have won awards for deploying energy storage to meet Southern California Edison’s Local Capacity Requirements. Coda Energy just landed a new CEO and is high on the list of SGIP-funded energy storage projects in California. SunPower is working very closely with Sunverge. Green Charge Networks, another California SGIP leader, just won a large BTM contract with a number of California schools. Gregg Patterson, the CEO of Demand Energy, alluded to the potential megawatts of energy storage available in the Indian Point offering and suggested that for now at least, "We are the only player in town." He said the company had a five- to six-month head start in New York, although a fast follower, along the lines of Tesla, Coda, Stem or Green Charge Networks, is surely on the way. In fact, the competition is already here. We spoke with Vic Shao, the CEO of Green Charge Networks, on Monday morning. His version of the New York situation has a number (six to be exact, according to the DOE database) of operational Green Charge Networks energy storage projects in New York City -- although Green Charge's lithium-ion battery installations are in the 50-kilowatt to 100-kilowatt range and are located outside at enterprises such as locations of 7-Eleven or UPS. Demand Energy is aggregating 1 megawatt and has managed to locate the lead-acid batteries inside the building. Demand Energy's Staker might agree with GCN's CEO when Shao says that "New York is buying dumb batteries -- the program design does not promote a marketplace." The CEO of Demand Energy had this to say: "To a large degree, we followed the herd in California, but we realized that we were fighting to take a first-mover position." In New York, "it took us five to six months to get through the very difficult building integrated storage requirements" of New York City’s Department of Buildings and the Fire Department that need to account for the high population density in the city and safety. “Our approval by both organizations is a major accomplishment." The U.S. Energy Storage Monitor report, the industry’s only comprehensive research on energy storage markets, deployments, policies and financing in the U.S. These in-depth reports provide energy industry professionals, policymakers, government agencies and financiers with consistent, actionable insight into the burgeoning U.S. energy storage market. Learn more at www.energystoragemonitor.com.